The first thing that caught my eye when the book arrived was the fact that it’s large; 248 thick pages of full color. Privateer Press has spared no expense at making the book itself appealing to look at. 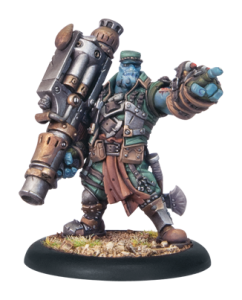 The visually appealing models drew me in at first, and the visually appealing book cemented my idea that Privateer Press knows exactly how to appease. The book greets you with “Page 5” aka “Play Like You’ve Got a Pair”, apparently a tradition in Privateer Press books. This manifesto lays out some basic guidelines and ethics for Hordes and even tabletop games in general. These guidelines urge players to play hard, play fair, and keep a good attitude. This is something that I think all tabletop books should have somewhere in them. Tabletop gaming is a hobby meant to have fun and there are times when people need a reminder of this. The book jumps right into the fluff after this. I must admit that I am the type of gamer that generally skips or skims most of the fluff and heads straight to the rules. I did read the fluff fully this time, however. While the stories are well written and there appears to be a deep back history for the world and all of the factions I did not find anything that particularly caught my eye. In addition to the fluff in the first few pages there are various histories and stories related to each faction in their specific sections as well. Anyone that enjoys a rich back story to their game worlds will not be disappointed in the amount of detail put into this world. In addition to the stories there is a very detailed map of the world that details things all the way down to the locations of specific palaces. Now onto my favorite part: the rules! 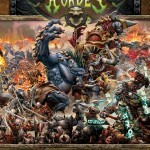 The Hordes rules are some of the most explicitly defined rules I’ve ever read. They cut off many questions I had very early on with very precise definitions and explanations. The examples scattered throughout do a great job of helping to cement any of the more difficult to grasp of the rules. The use of very specific game terms to define just about any situation looks to cut off a lot of problems before they arise. I was very pleased with the rules. I come from a background of mostly small scale skirmish games. One of the things that excites me about Hordes is that I can jump into it quickly with some small scale skirmishes, but the game appears to scale very well to extremely large battles with dozens of models on each side. I can’t wait for the day I field a full 200+ point army in an Apocalypse match. I will say that even though the rules appear very precisely defined there are still a lot of them and the game does seem somewhat complicated with all the options available. Personally, I find this to be a (mostly) good thing. The downside is that you will need to make use of quite a few counters during the battle to keep track of everything. However, the more options available to me the more I can personalize my strategies. For example, I really like that in addition to basic attacks there are rules for Power Attacks which include Headlocks/Weapon Locks, Head-Butts, Pushes, Slams, and Throws. With things like throws comes additional rules for collateral damage. These are the types of things I wish games did more often. Battles are so much more than just swing after swing. The idea of a massive warbeast picking up an enemy and hurling them into a group of enemies damaging them all gives me warm fuzzy feelings. In addition to these standard Power Attacks each model has it’s own set of special rules. These special rules vary from Abilities that modify standard rules for that model to a Warlock’s Feats that can be used once per game to Special Actions or Attacks. I may not have had a chance to experience these in play yet, but reading through the rules for some of the models they look pretty interesting. The combination of all of the standard and special abilities available gives the player a huge amount of options as to how to play the game. The main aspect of Hordes, though, is that of the Fury mechanic used by Warlocks and Warbeasts. The main characters of a Hordes battle are the Warlocks. In a standard game the winner is the last person with any remaining Warlocks. Warbeasts are essentially their weapons of mass destruction. Warlocks can force a Warbeast to do many things during it’s activation, including make additional attacks, boost rolls, or charge/run. When forced, however, a Warbeast will gain fury points. The player must be careful to manage the fury points of his Warbeasts because they increase the chance that the beast will frenzy, attacking any nearby models including friendly models or even the Warlock himself. In addition, Warlocks can leach fury points from his Warbeasts to use for himself. This fury aspect is a nice, unique feature of Hordes. I love the idea of balancing the risk of frenzying beasts versus the rewards of forcing them. The idea of risk versus reward is one of the things that is very underutilized in games everywhere, and fury seems like a perfect way to execute it. Another interesting aspect of Hordes is the effect of facing. In most games I’ve played in the past facing had very little effect, with your models generally assumed to have full awareness of their surroundings on all sides. 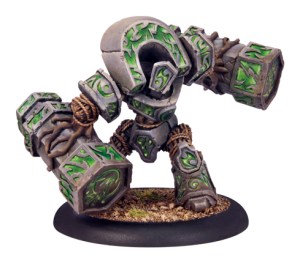 In Hordes facing is so important that Privateer Press recommend you mark the locations of the front arc and back arc on the model’s base. In addition to a model only having line of sight in their front arc, there are also bonuses for attacking a model from it’s back arc. As mentioned earlier, a standard game is won when only one player has any remaining Warlocks. The rulebook does provide a few additional scenarios. These scenarios seem to all be centered around the idea of capturing and holding specific locations, so don’t expect too much variety here. With all the options available to a player during a game, though, this may not be a big deal. In addition to all the standard rules, there is an additional section for binding rules for a campaign or escalation league. These rules allow you a Warbeast to “bind” to a Warlock, giving them an extra bonus. This looks to be a nice addition to make a campaign feel more varied than a single game. The one major gripe I have is the lack of any sort of quick reference sheet or section in the book. I love to have a quick reference sheet handy, even for games I know very well. It’s much easier than having to flip through the whole rulebook to find that detail you have trouble remembering. It would also help to cement my understanding of how a model’s activation works, as there is still a small bit of confusion there for me as well. After the rules there is a section for each faction which gives the full stats for a few models from that faction. This is not a full list of the models for that faction; you must purchase that faction’s book for that. The good news is that the models come with their own stat cards and a full set of stat cards for each faction can be purchased separately, so the faction book is not absolutely necessary to play the game. Finally, near the end of the book are included galleries and a Hobby and Painting Guide. There are pictures of many models from all the factions in the galleries, which I personally really like. This is a big help for me in determining which faction I want to start collecting. The Hobby and Painting Guide is also a great section to help teach new players the basics of painting as well as give techniques for new and advanced painters to use. There are several different techniques explained (with pictures for each step) that show how the models shown in the book were painted. I’m always looking for new painting techniques, and having step by step tutorials with pictures is a big help. Overall, the Hordes Primal Mk II rulebook is a very sound purchase. The book itself is packed with plenty of goodness in addition to the rules. The game itself, while somewhat complicated, looks to be a very fun and interesting game, different than some of the stuff I’m used to. I’m excited to get started with it. 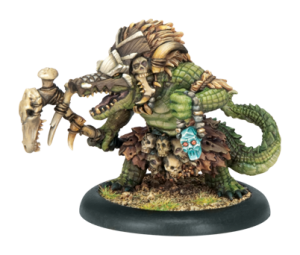 In addition, Privateer Press has some exquisitely sculpted models that I can’t wait to start collecting. 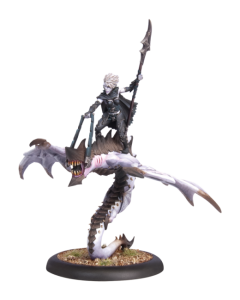 If you are a Hordes/Warmachine player, sign up for the Tabletop Geeks Galleries and upload photos of your miniatures! This entry was posted	on Saturday, October 23rd, 2010 at 1:27 pm	and is filed under Reviews. You can follow any responses to this entry through the RSS 2.0 feed. You can leave a response, or trackback from your own site. Man, I have resisted hordes for a lo-o-o-o-o-o-ong time. The Circle stuff is awesome! I have painted one so far (http://thegoldend6.com/gallery/hodes-circle-orboros) and Kaya is well on the way.